Sound issues were for me the worst thing about level editing when I started. There was no way to add a sound directly to an animation, and if a sound does not exist in at least one animation it will be deleted from the wad by WADMerger when the wad is saved. Now I have made this little tool that allows you to add any sound to any animation, and next you can import the animation to your wad by WADMerger and the sound will stick in your wad. 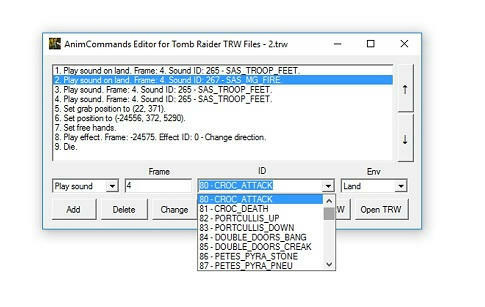 Of course, the sound will not play in your level if it is not added also to the SFX & SAM files, but there are many available tools for editing those. Last edited by HD86 on 10 Jan 2017 19:50, edited 1 time in total. Thanks! You solved my recent sfx problem, I had these new sounds disappear. I thought they just fail to be added, I didn't know they're dropped as "unused". It's very similar to what happens to textures, but that occurs in right moment. Is there a chance to run your tool without installing the framework? WadMerger doesn't require it, only the VB runtime. This is written with C++/CLI, so it requires the .NET framework to be installed on your machine. I made it this way in order to save time, because if I were to write it in the native C++ code it would have taken me longer time to finish. Also it would have been bigger and buggier. HD86 wrote: This is written with C++/CLI, so it requires the .NET framework. So everyone using this tool will need extra time instead... Nope. These frameworks are usually confusing, hard to tell which version is needed. What would be really cool is this tool incorporated in WadMerger Fix 1.0.0.5. Also it would have been bigger and buggier. - hit change if no sound command exists. DJ Full wrote: What would be really cool is this tool incorporated in WadMerger Fix 1.0.0.5. When I looked into the issue of wad editing I realized that the authors of WADMerger neglected to add some possible features not because they could not add them but simply because they did not want to spend so much time on them. WADMerger is an extremely buggy app. Even after all the patches it is still buggy. It seems that the original author of the app chose not to include any exception handlers at all. He was trying to finish as fast as possible, because this was a huge work (and it was for free). So answering your question: Paolone can easily add this feature to WADMerger if he wishes to. He does not need to be contacted by me. He probably has more important things to do with his new TRNG updates. This is sad to hear. I hope these error messages do not prevent the tool from doing what it is supposed to do? What do the messages say? HD86 wrote: It seems that the original author of the app chose not to include any exception handlers at all. Paolone can easily add this feature to WADMerger if he wishes to. He does not need to be contacted by me. He probably has more important things to do with his new TRNG updates. I hope these error messages do not prevent the tool from doing what it is supposed to do? Something about unhandled exception... possibly one of these missing "exception handlers"
WADMerger has improved significantly after recent patches by Paolone. Two years ago it was unbearable. It would crash everytime you run it. Sad to hear that there are unhandled exceptions in this tool, but I am glad that it did not completely crash and it still did its purpose. Thanks for your feedback DJ Full.